Maria Speck (author of cookbooks Simply Ancient Grains and Ancient Grains for Modern Meals) is inspiring, knowledgable and endlessly creative when it comes to this vast category of flavor, texture, culture, . . . Hearing her talk about her youth in Greece and Germany and her mother’s simple, deeply flavorful, fresh food and her own many decades of cooking all over the world made my mouth water. Her philosophy echoed mine: fresh produce and simple staples, cooked at the beginning of the week, can be the foundation of many a meal. She reminded me of bulgur. I have neglected my jar of it for many months and I had a busy week so I figured I’d cook a pot of it and see how I could use it throughout the week. 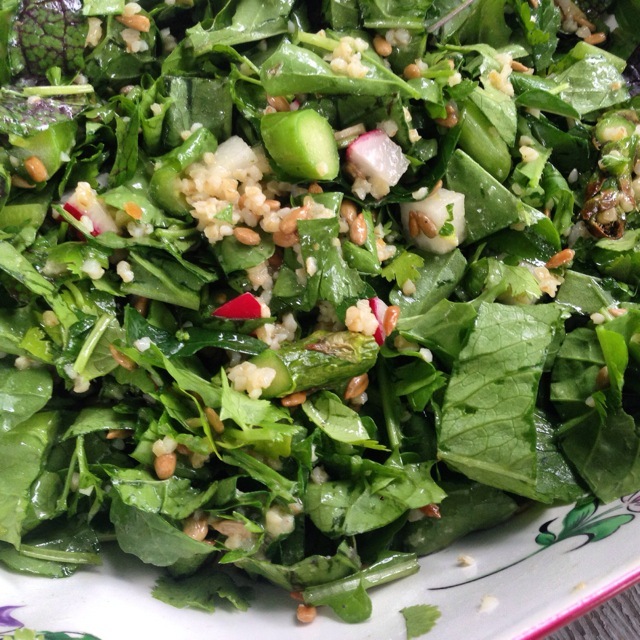 Monday: Salad of roasted asparagus, mustard greens, arugula, radishes, bulgur, toasted sunflower seeds and a lemony vinaigrette (recipe below). Tuesday: Added bulgur to chicken soup for my son’s school lunch. Wednesday: Black beans in their broth topped with bulgur (that I had toasted in a small skillet in some olive oil which gave it an extra dimension), cilantro and harissa. Thursday: Broccoli and bulgur patties with cilantro, eggs, a bit of sharp cheddar and more harissa (recipe on the Seasonal Recipe Collection). Set your oven to broil. Snap off the tough ends of the asparagus. Put the washed spears on a sheet pan and drizzle with just a little olive oil and sprinkle with salt. Broil, turning once, for about 10 minutes until browning and tender. Remove from oven and let cool. Slice into 1/2-inch slices on the bias. Whisk the dressing ingredients together in a small bowl or shake them up in a tightly sealed jam jar. I make this type of dressing in a jar and top if off as needed all week. You may have more dressing than you need for this salad so the jar method is a good one here. Put all the salad ingredients in a large blow. Add about 3/4 of the dressing and toss well. Taste and adjust with salt, lemon, etc. and/or add more dressing. Serve immediately. To cook the bulgur: Bring 1 3/4 cups water or broth (I used homemade veggie bouillon broth) and several pinches of salt (if you’re using water) to boil in a saucepan. Add 1 cup of bulgur and stir well. Simmer the bulgur, covered for 10 minutes. Turn off the burner and keep the pan covered and let the bulgur steam for 10 more minutes. Fluff with a fork and use as needed. Store in the refrigerator for up to 5 days. 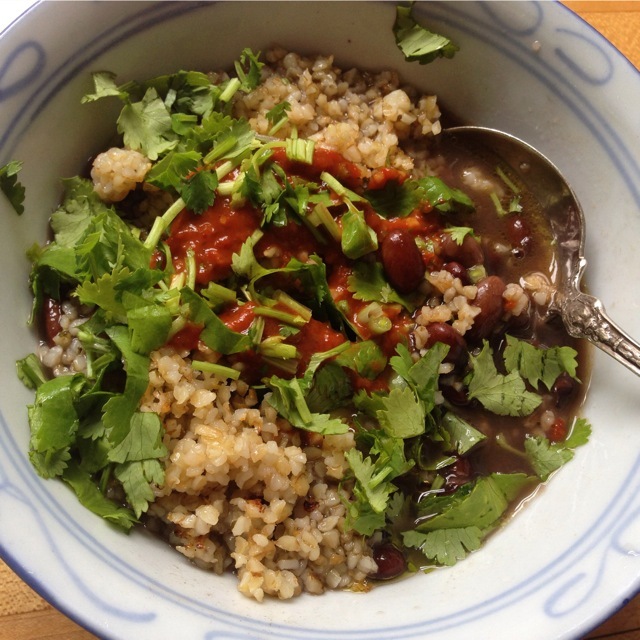 Soupy black beans topped with bulgur (warmed up by toasting in a skillet with some olive oil), cilantro and harissa. Does bulgur have a high gluten content? I’m not sure how it compares to other grains in the wheat family. It certainly has some but I don’t think it’s made with some of the newer varieties that were bred to have more. Give it a try, in this salad and see how it works for you.